Delta Outdoors is your Alaska Winter Headquarters! UPDATE: December 2018. We are currently able to do dog sled rides on snow! Longer, overnight trips are also now available in limited areas. Ice-caving trips are now available. Snowmobile trips are possible, but we are only offering full-day trips with snowmobiles in the Denali Highway area. Low snow conditions near Delta only allow for limited 1/2-day trips. We offer tours for the entire family and to fit any appetite! Whether you wish to ride on a dog sled, learn to drive your own team of huskies or take an extended expedition; this is the place for you. Additionally, we have snowmobile trips and Ice fishing expeditions available. Delta Outdoors is one of the few places in Alaska that offer the opportunity to explore an ice cave under a glacier. We expect to have sledding conditions into mid-May! By then Crazy Dog Kennels may have the only opportunity on the Highway system for a dog sled ride on snow! Our rides are generally 4-8 miles in length. You will have the opportunity to help drive the team if you like; not just sit in the sled. No Arctic gear? No matter, we can fit most sizes. You will meet and pet the liveliest and friendliest dogs in the world! Visitors will get a quick overview of the kennel and how sledding works. Holiday specials and group rates. Under low snow conditions, check out the dogs from the comfort of a heated ride! We offer family sledding excursions from our Delta Junction kennel. Perfect for all ages! 1/2 day and full day mushing. We also offer extended trips tailored to fit your needs. overnight trips begin at $495pp. contact us for pricing on extended trips. Kids 5 and under are free with adult. Drive your own team Spend a half-day learning to harness, and hook "em up! Bring your winter boots and your patience! These dogs are lively and eager to go! Go for a ride under the Northern Lights! Delta Junction is a great place to view the Aurora! Tours begin at dark, depending on the season. These trips are geared for the adventuresome. 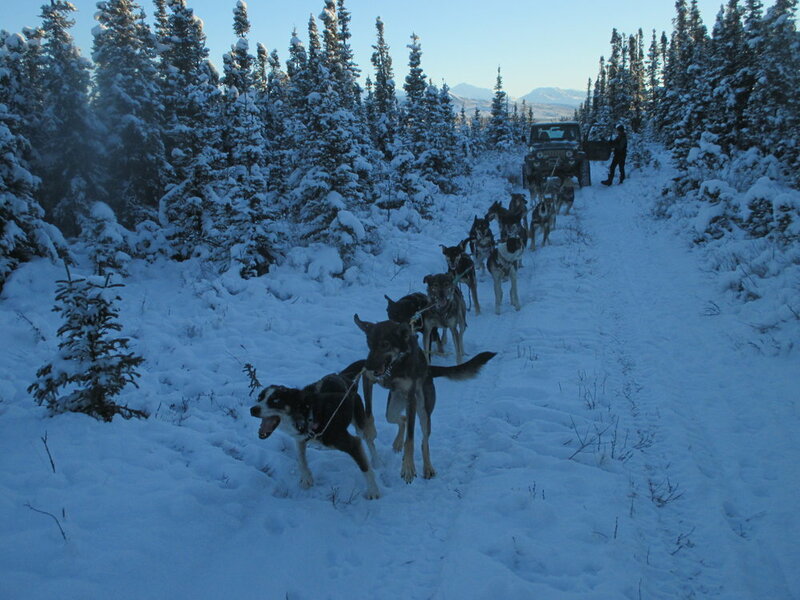 3-4 days allow for 100 plus miles of travel by dogsled. Your trip begins at the eastern terminous of the Denali Highway and travels 42 miles above timberline to our Denali Highway cabins on the banks of the Maclaren River. Pricing begins at $1150 pp. for 3-day trips. Most think that dog sledding is limited to the winter months. Not so! Dogs can run the year around, and do! We offer rides on a comfortable ATV when temperatures are below 55* ----or rainy. If it is too hot for the dogs to run, you can come to the kennel to meet the dogs and get your dog-fix! Comprehensive and informative tours are available the year around. We can accommodate groups of any size from 2-30. John and Zoya are available to speak at your school or event. Zoya is a 2-time Iditarod finisher and motivational speaker. Her unlikely journey from modeling to the back country of Alaska illustrate an "You can do anything!" attitude. Business owner, Iditarod Finisher, and mother of two; Zoya exemplifies positivity. John is a lifelong Alaskan who has competed in many long distance dog racing events. He is a two-time Yukon Quest champion and has won numerous other races in Alaska and across the U.S. He is a pilot and an Outdoors writer and currently publishes a weekly column for Alaska's largest newspaper. email; teamzoya@yahoo.com or call 907-388-6039 for information.